Ahead of the start of this term, I was reflecting on where we need to go next to raise standards at Highbury Grove. Everywhere I look to find schools that are doing better than we are by some measure I see that they appear to be more disciplined; they secure stronger engagement with their expectations; their systems are tighter. There’s not one school I look to where I see things being looser or more relaxed. But it’s not as simple as that; it’s not just a case of having ever tougher rules and sanctions. As we’ve learned in our journey towards ‘impeccable behaviour’, as described in this blog, the purpose of sanctions is to motivate students to make the right choices; our system is meant to motivate them to engage with the ethos we’re trying to establish. We’ve discovered that, whilst the system works for most students, it doesn’t work for some; for too many. For some, the stick doesn’t deter them enough and they can hit the wall of consequences and sanctions over and over again. For some, the system feels too punitive and they kick against it; it doesn’t motivate them to learn or, in some cases, to come to school at all. 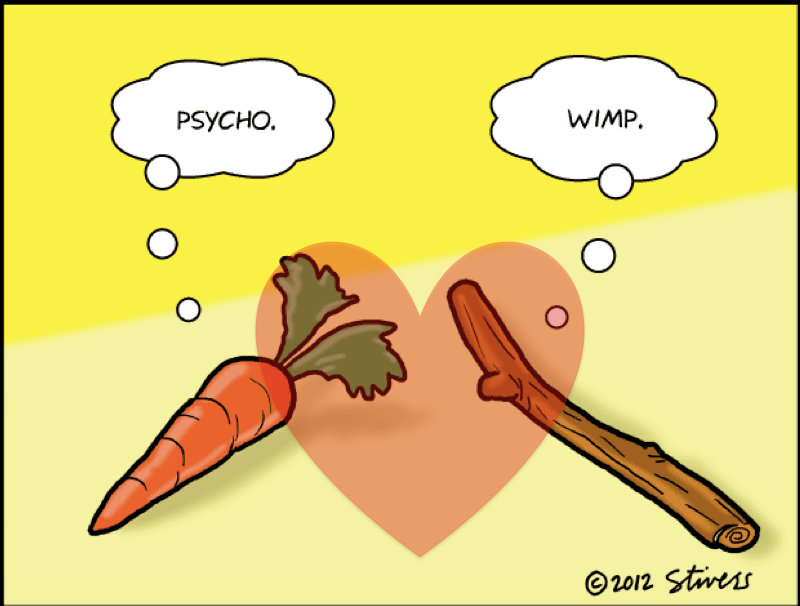 On the first day of term I suggested to staff that what we need is not to see Stick and Carrot as opposites. Yes, we do need to make sure we are consistent and persistent with enforcing our expectations, setting a high bar, demanding high standards from every student without exception. Yes, we give detentions for not having a pen. But we also need to be kinder, more loving, warmer, nicer, more welcoming, more understanding…. It’s a case of discipline with love. The key to this is the language and tone of our interactions with students every day. This approach brings into play all the Bill Rogers strategies about positive correction and the language of choice; about being assertive but not autocratic; about building relationships and being the adult. It requires a conscious effort and some self-awareness to fully embrace this. In giving sanctions, we are reinforcing our expectations, we’re keeping the bar high – but are we also communicating that we care, that we listen, that it’s not personal – and that we’ll welcome the students back with open arms and a clean slate tomorrow? Another dimension to our discussions is the role of positive affirmation; making students feel good for doing the right thing, for making progress, more being kind, for acting in all the ways we want them to. We’re investing in more systems to support this (ePraise is due to be launched soon, so parents get an alert every time a child gets an achievement point or receives an ‘accolade’) but, again, the key lies in the language we use day-to-day. It’s not about giving out cheap tokens just for meeting basic expectations but there’s enormous mileage in saying ‘thanks’ and ‘well done’ and giving as much attention to all the students who do the right thing as to those who don’t. The motivation to conform to expectations and to commit to facing the challenges of learning has got to be as much about the positive feelings that come from doing the right things as the desire to avoid negative consequences for not doing them. It’s not one or other. We need a bigger carrot and a more consistent stick (‘bigger stick’ sounds wrong!). More discipline, yes – but discipline with love, warmth and kindness. There are too many factors which may lead to this attitude from being a CLA, SEMH, attachment, other SEN, etc many of which can be effectively supported through nurturing approaches (implemented very thoughtfully, carefully and timescaled rigourously!) and other interventions many of which I am sure the school will already use. One thing is clear, if the system doesn’t work, these youngsters will remain within it until a solution is found. Each time they return becoming more disaffected and disillusioned. However, there is one thing they definitely need beyond anything else and that is positive attention. Not demanded attention but planned, timed and focussed. The other obvious is modelling since many of these young people will have grooved negative perceptions of relationships where a perceived hierarchy exists. In this case, there definitely is a hierarchy and they need to know it but they also need to understand it’s purpose and rationale. I really like your posts even if I do not always fully agree; you are one of the genuinely reflective voices of social media in education and your focus is always on what is best for your students as learning people. This post highlights the importance of values and relationships in schools. It has been said (but I cannot cite the source) that secondary schools base discipline on Sat rules where primary schools do so I’m shared values. This is obviously a gross generalisation but holds some truth. Reading some of your blogs I get the impression that values lie at the centre of your approach. Not in a vague, pink and fluffy way, but in the understanding of what holds a learning community together. I wonder how shared and explicit these values are and the extent to which students and adults but into and model then in the day-to-day life of the school? This may well have been addressed in one of your blogs that I have not yet read! Have you heard of or thought about Values based Education and linking it in to a deeper understanding of SMSC? I can email you something on SMSC that helps develop it in a more educational was than simply Ofsted if that helps. I work with Barry on the Alevi project so this is not a cold call! I just get frustrated at the number of people who go to one extreme or the other and you seem to appreciate the power of creative tensions which for me are inherent in education, values and learning relationships. Let me know your e-mail if you are interested. I am also interested in this. Please can you send me details? I work for epraise and we’ve just seen the link to your blog on Twitter! You’ve really summed up how we feel about rewards and why it’s really important to get it right too. It’s given us a bit of an idea…we’re in the process of re-designing some of our free posters on our website and I thought that maybe we could do a series of positive affirmation posters for staff to put in their classrooms and I wondered wether you would be keen to get involved in helping us to come up with some ideas?